Wowww...this looks soo tempting Rads!! Me wants this lippi nowwwwwww!!! And I want this warm pink shade only!!! I was much better earlier naa...even I was just now only reading that review and I was like I have become one buddi amma now!!! 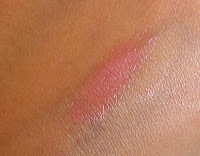 No blog sale - but I have this Avon lipstick..me not using...so me thinking...me mail you? Me check and tell price first!!! Heheheheheee...next time I see things like this on discount no I will tell you! U read Jomo...washes her hair with Rs.12 water!!!! *shock*...i mean how rich she must be na!!!!!! Me too :(( Rs. 40 for a can :(( Pls dont throw me out of the fund :(( You buy lehenga and you gareeb..me buy water and me gareeb. Heheheeee :P :P I heard noises when I called her..and she kept the phone also so fast..
We will, of course, have to deny it's us...see Rads...is not me..is someone else..no idea who??!! We say JOMO said if we dnt tell all this ...she will plan sumthng nasstyy foor us..then to she will hav to forgiv us...lol. happydance happydance happydance...btw Rads y dnt u put smileys...is sooo much fun to use..yesterday hubby taught me how to use hearts in gmail chats...was sooo much fun!!!! I don't know how to add smileys in Blogger..you can add a click on kind of thing, but I find it a bit boring. its pouring here.......wht plans !!!! I wanttttt tooooo...checking for office boy now !!!! you dont have any dinnooooos left???? Ohh..nice idea..me go see and get stitched too :D :D Nainaaaa...shopping photos kab?? Love the packaging :) Have u applied a gloss as well?? d packaging is so awesum..n d shade is nice too..me likes..
Radsssss..you back!!!!! Where were you since all these days??????????????? ?